"Very passionate about the cases they take on"
"Not a lot of the vanilla, large PR agencies could handle it"
"The agency is also commended for providing spot-on judgements"
“The team has made a genuine contribution to our recent growth"
London-based communications agency specialising in corporate, legal and litigation PR, and reputation management. We pride ourselves on our high levels of national and international press, broadcast media and trade press coverage, as well as keeping our clients out of the news when required. RT @PeopleMgt: How can #HR best minimise unconscious bias in the workplace? 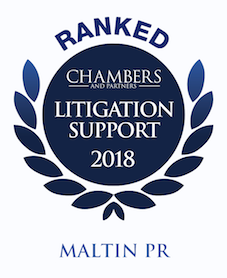 Litigation PR is increasingly important for our clients and we are frequently involved in providing PR support around High Court proceedings in London. Corporate communication is the voice of your business. It must be clear, controlled and consistent – enhancing your reputation and addressing your target audiences. Maltin PR’s public affairs team helps clients navigate the political process, connecting individuals and organisations to the correct audience, and ensuring clients receive a fair hearing. Chief Executive Tim Maltin examines the importance of Litigation PR support for Legal Business magazine.